This page provides a quick overview of basic Goldfish information. Hopefully this will spark enough interest in these fascinating creatures that you will decide to keep some. This web page on goldfish basics briefly explains how far goldfish have come in the last 1000 years of domestication, and some important facts you need to know before you purchase any. Domesticated goldfish (Carassius auratus auratus var.) have been around for a very long time. The earliest verifiable date was around 960 AD in China. Over the centuries, goldfish have been selectively bred first by the Chinese, then the Japanese into highly evolved varieties, far removed from their Prussian (Gibel) carp ancestry. By selectively breeding natural mutations, goldfish have moved from drab silver grey short finned fish to highly developed, brightly colored exotic (some may say bizarre) looking specimens. There are well over 100 varieties of goldfish. Many aren’t available in Europe or America, only in their home countries. Beginners should gain experience with hardy cheaper varieties such as Comets, Fantails and Moors, then move on to the more exotic varieties such as Water Bubble Eyes, Lionheads and Celestials. Goldfish can come in any color but rarely gold, ranging from jet black to white to red, or any combination of these colors. Color combinations depend on the scale type. There are three; metallic, the most common, nacreous (calico) and matt. 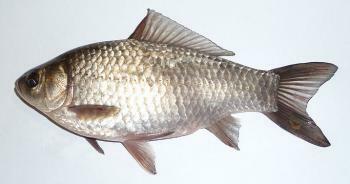 The Common Goldfish has the same fins as its ancestor the Prussian Carp (Carassius Gibelio). Every other variety of goldfish has had its fins altered by selective breeding. Single caudal. (The Common, Comet, Bristol and London Shubunkins are the only other single finned varieties). Twin caudal fins and no dorsal fin. There are variations within each of these forms such as length, fullness and shape. Short and rounded. These varieties all have twin caudal fins with deep rounded bodies (Orandas, Moors, and Veiltails). Short and rounded but not as deep as the varieties mentioned above. These varieties lack a dorsal fin (Celestials, Water Bubble Eyes, Lionheads). Fluid sacs growing from underneath the eyes (Water Bubble Eyes). Don't ever mix normal eyed goldfish with the other three types as they will always get to food first. Goldfish are omnivorous, meaning they eat plants and animal based foods. They need both to remain healthy and avoid digestive problems, especially those with short rounded bodies. The amount of plant or animal based food depends on the season, age and whether you plan to breed your goldfish. Goldfish can live in very cold water, just above freezing, but only for short periods of time such as during winter. They can also live in temperatures close to 100oF (38oC) but the temperature change has to be very gradual. 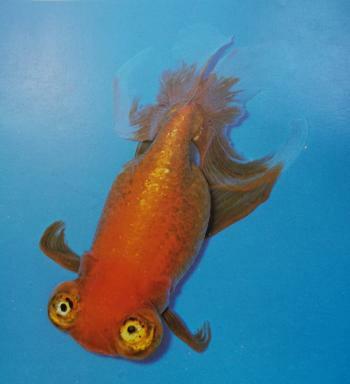 Only when the water temperature is in the mid ranges of above 55oF (13oC) and below 80oF (27oC) do goldfish thrive. Goldfish need approximately 24 square inches of surface area per inch of body length. Fancy deep bodied varieties require even more square inches of surface area than the figure above because they have greater body mass per inch. Goldfish are extremely tolerant of a wide range of water conditions and can live in hard, soft, acid or alkaline water. But they won’t tolerate low dissolved oxygen levels caused by polluted water or overcrowding. Using aquarium water filters does allow higher fish numbers to be kept because more water is exposed to the air and pollutants are removed. Goldfish are egg layers. The female scatters her eggs randomly amongst plants growing in the shallows as the males follow in close pursuit to fertilize them. Goldfish get sick or die because the conditions they are in have weakened their immune system. The number one killer of goldfish is polluted water caused by overfeeding of dry foods. Rotting uneaten food quickly causes an ammonia spike in the water which is a killer for all fish species. Goldfish can be kept indoors or outdoors. If keeping them outdoors, the pond or container needs to be big enough to avoid large temperature changes at night. It is perfectly acceptable to keep goldfish indoors in a 15 gallon aquarium where the temperature will not drop markedly during the night. If a 15 gallon container is used outside, the temperature drop in some seasons will be too great too quickly. An outdoor pond should be at least 80-100 gallons. Goldfish kept outside must be covered to protect them from birds and cats. Their bright colors make them an easy target for birds. If you train your goldfish to come to a certain spot for feeding, your cat will love you for it. Now that you know the goldfish basics, learn more about Goldfish care, or go to the page that explains how to choose goldfish that are healthy and varieties that can be kept together.